Who is the greatest Fast Bowler of all time? This week, Dale Steyn became the seventh highest wicket taker in Test Cricket among fast bowlers. He gives away a miserly 22 runs for every wicket he takes (bowling average), and takes a wicket every three overs or so that he bowls (strike rate). That is truly remarkable and puts him above all seven bowlers above him in terms of how often he takes a wicket. And after 84 Tests and 12-years at the head of the Proteas attack, he continues to hurl those deadly missiles down at about 143 km/hour. So it’s most likely he will move up in the wicket takers’ list as long as he keeps playing. But does that make him the Greatest of all time as some would like to believe? He has some serious names to contend with. 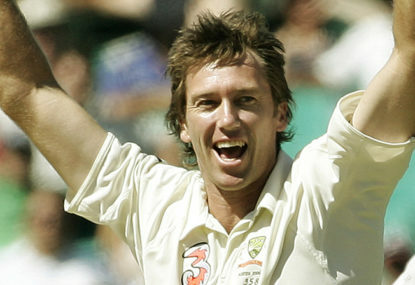 Glenn McGrath sits on top of that list of wicket takers with 563 wickets from 124 Tests with a better bowling average. He gave away only 21 runs for every wicket he took over a longer career of 14-years, managing this over an extra 40 Tests that he played compared to Steyn. Sir Richard “Paddles” Hadlee, the original ‘Sultan of Swing’ with 431 wickets from 86 Tests, giving away 22 runs for every one of those wickets, would be a worthy candidate indeed. Courtney Walsh with 519 wickets from 132 Tests at the expense of 24 runs for each of those wickets, makes a very special case. Between 1984 and 2001 when he played, the West Indies team was in decline, so the burden of winning matches against the best teams in the world, fell squarely on his broad shoulders. Is he the one? Wasim Akram was perhaps the greatest left arm fast bowler of all time, and the benchmark which all modern left arm fast bowlers are judged against. He took 414 wickets from 104 Tests over a remarkable 17-year career giving away 23 runs for each of those wickets. If he had not been playing for Pakistan, with its inherent political and safety issues, he would probably have played the 132 Tests that Walsh did in the same period. And at his normal rate, his tally would have been 525 wickets! Kapil Dev was a remarkable phenomenon. A genuine fast bowler comes out of nowhere from a country that frequently had one of its great spinners open the bowling. He plays for perhaps the weakest team in the world of the time, stays at the top level for 16 years and ends up taking 434 wickets in 131 Test matches, many of them on spinning tracks offering no help at all to fast bowlers. Michael ‘Whispering Death’ Holding, Malcolm Marshall, Dennis Lillee, James Anderson, Imran Khan, Waqar Younis, Shaun Pollock. There are some of the greatest bowlers of all time who could also lay claim to the honour. But what makes a great fast bowler? And what makes one or more among them the greatest? Pace is clearly a big factor. But the fastest bowlers on the planet will rarely make any of the greatest lists. Seeing a Jeff Thompson, Wes Hall, Brett Lee or a Shoaib Akhtar tearing in and hurling 5 ¾ ounces at you at over 160 km/hour will be enough to make anyone cringe from physical fear. But mental strength to rise above physical fear is just one characteristic that distinguishes the best batsmen from the rest, so speed is an essential ingredient, but not enough. Swing and other variations including a deadly yorker, combined with speed, gives us a smaller subset of great bowlers to work with. The side you play for, when you are both fast and have all the tricks up your sleeve, is also clearly a determining factor. If your batsmen get out below 250 every time they go out to bat, you are going to be a wreck bowling for long periods of time with the whole team dependent on you to take them to victory. And some of the best names above have played for such sides. But in the end it needs to be a combination of all the above, but with the ability to take wickets under all circumstances, on all kinds of wickets. (A home pitch bully just won’t cut it in this exclusive short list) And an ability to run through batting sides that would leave any top bowler with pre-match nightmares. Should it be Richard Hadlee who essentially built the Kiwis into a formidable power to reckon with in Tests and in whose time New Zealand remained unbeaten at home for 12 years? Should it be Glenn McGrath who was the fast bowling cornerstone of the most successful Australian cricket team in history? Should it be Kapil Dev who is surely the most remarkable story of all of them in emerging as a world beating fast bowler from a country without any pedigree in the art or the facilities to support it? Should it be the unassuming Jimmy Anderson who has been bearing the accusations of being a home pitch bully all his life, but has quietly built up to being one of the Top ten fast bowlers of all time in terms of wickets taken? Or should it be one of famous battery of West Indian fast bowlers who strutted around the world, conquering whoever stood in their way with almost ridiculous ease and elegance? It could really be any of the above, or some I have not named here like Allan Donald, Freddie Trueman, Ian Botham, Bob Willis, and many more. But in my books, the man who could just pip the others to the post (although not by much), would be Wasim Akram, a man who redefined the art of fast bowling. 104 Tests. 414 wickets @ 22 runs apiece, and 881 wickets in First-class cricket. Arguably the founder of reverse swing bowling and the man with the most lethal swinging yorker in the history of Test cricket. When Sir Viv says that about a bowler, it’s time to shake your head in wonder and hand Akram the crown.